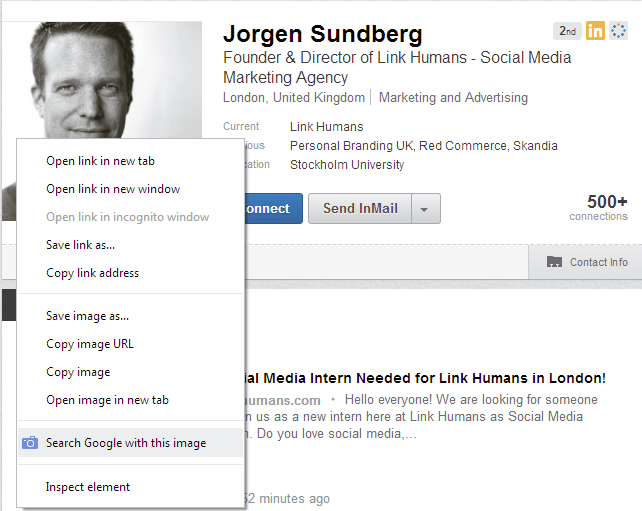 Have you ever wondered what the easiest way is to find out the other social profiles for a specific candidate? Need to learn more about a candidate by reading their Twitter feed? Would you like to see where they check in on a regular basis via Foursquare? There are plenty of plugins that can aggregate profiles for you, but we can go into that another time. For now, I would like to show you a quick and simple trick to search for people using their profile avatar (profile picture) using, probably the most powerful aggregator out there, Google! For this trick you need to install and use Google Chrome (get it here). Once you have it open, lets install a very simple extension plugin called “Search by Image (by Google)” (get it here). Open the link and click “Add to Chrome” in the top right. Once it is installed, go to a LinkedIn profile. I have chosen Jorgen Sundberg, founder of this blog, as my example. 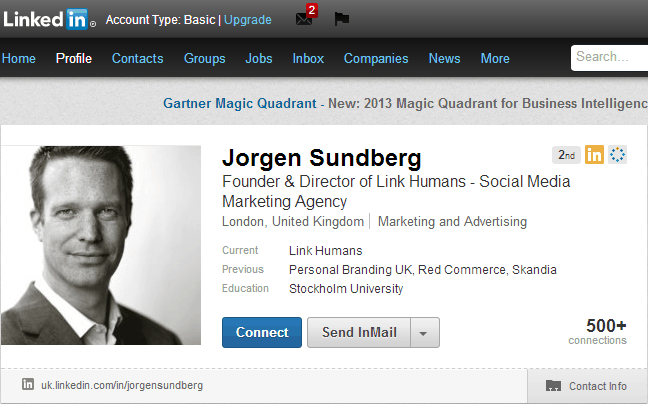 A high percentage of people use the same profile avatar for multiple social networks – and Jorgen is a good example of this practice. From this result you can see that we now have links to his Twitter page, LinkedIn profile, Google+, Facebook Profile, His Blog (This one) and his YouTube Channel. All with a single action! Results will vary depending on how active the candidate is and how often they use a single avatar as their profile picture obviously. With the release of Google Glass (coming soon! ), Google have been re-indexing all images stored to give better facial recognition results. 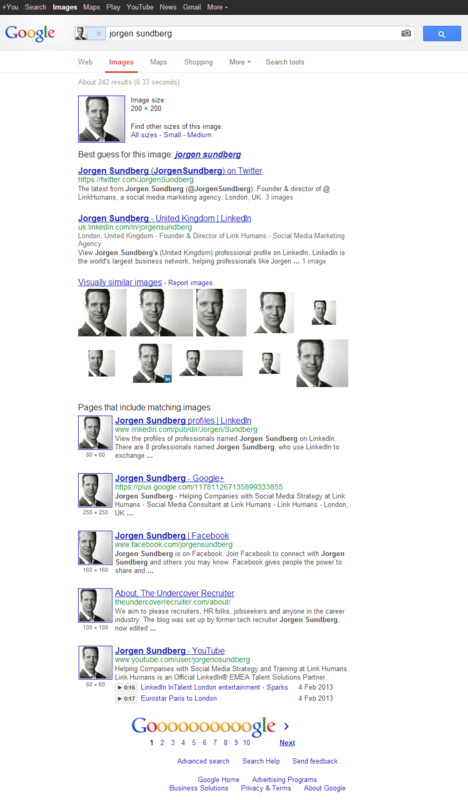 As you can see at the top of the Google results page, it says: “Best guess for this image: Jorgen Sundberg” which tells me that Google are starting to store names associated to images or that facial recognition will start telling us who people’s faces are! But again that is a conversation for another time. Have you got any other methods of doing this quicker? Had success with this technique? Let us know with a comment below. RELATED: How Many Companies Use Social Media to Recruit?